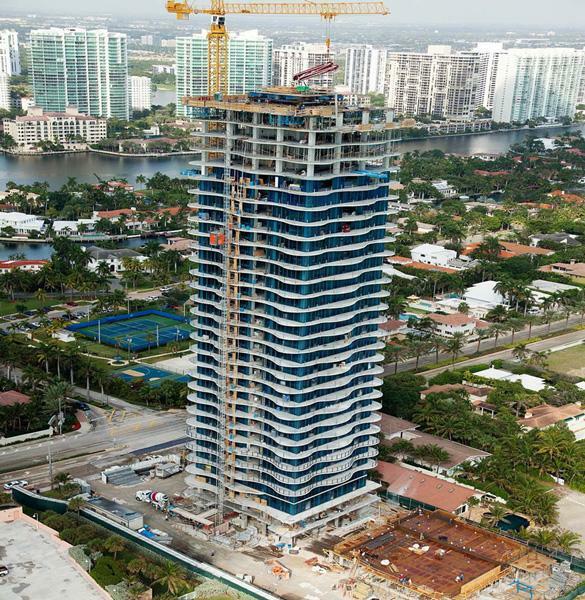 Marketed as the most luxurious building in South Florida with only one unit per floor, the Regalia Sunny Isles Beach Condominium is going up with the fastest formwork on the market. The design of the building requires a minimal amount of columns to give the building an open floor plan. However, this design feature required a large shearwall/elevator core for cross-bracing of the building. 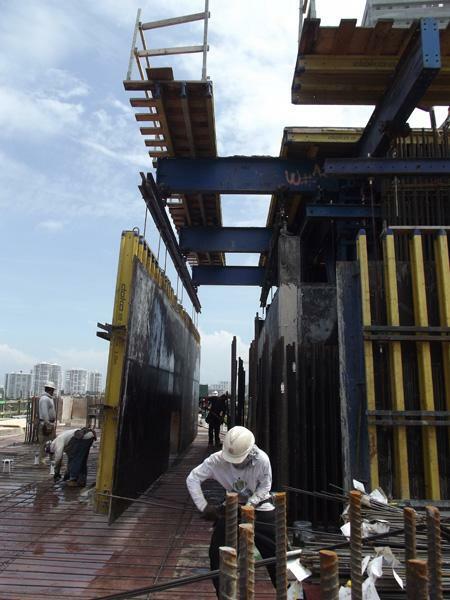 Finding the right formwork solution – preferably one that allows the crews to cycle the vertical and horizontal formwork at the same speed in order to meet the tight schedule -- was key. 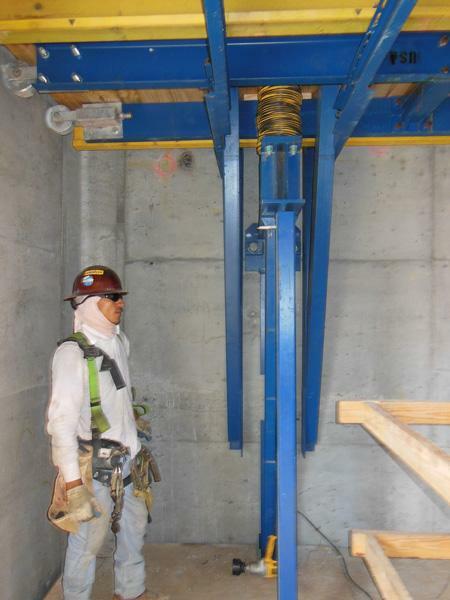 To meet these demands, concrete contractor Southern Pan Services (SPS) selected Doka’s Super Climber self-climbing form system with working platform for high-rise cores. 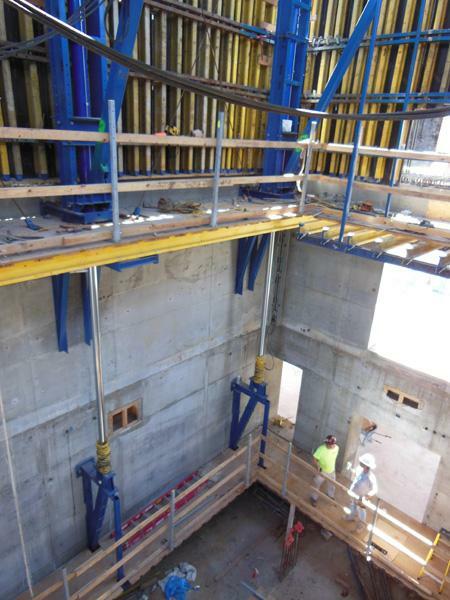 The Super Climber system, Doka’s newest member of their multiple climbing formwork systems, meets the tough requirements of extreme dynamic loadability with swift, smooth climbing. All operations can be carried out safely and quickly on the formwork’s large, fully enclosed workspace, because the climbing formwork system is anchored to the concrete at all times. 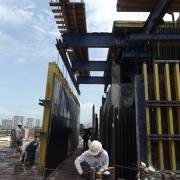 The entire core formwork is repositioned hydraulically with just one lift. 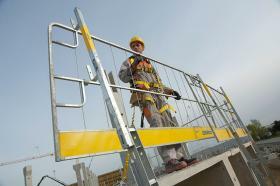 This self-climbing core system is a safe and efficient way to construct high-rise cores. 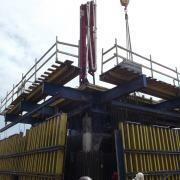 It has room for all of the site equipment needed and is a safe and efficient way to construct high-end cores. It has room for all the site equipment needed and is enclosed on all sides for safe, weather-shielded working at any height. The allowable live loads on the platform mean that less storage space is needed on the ground. 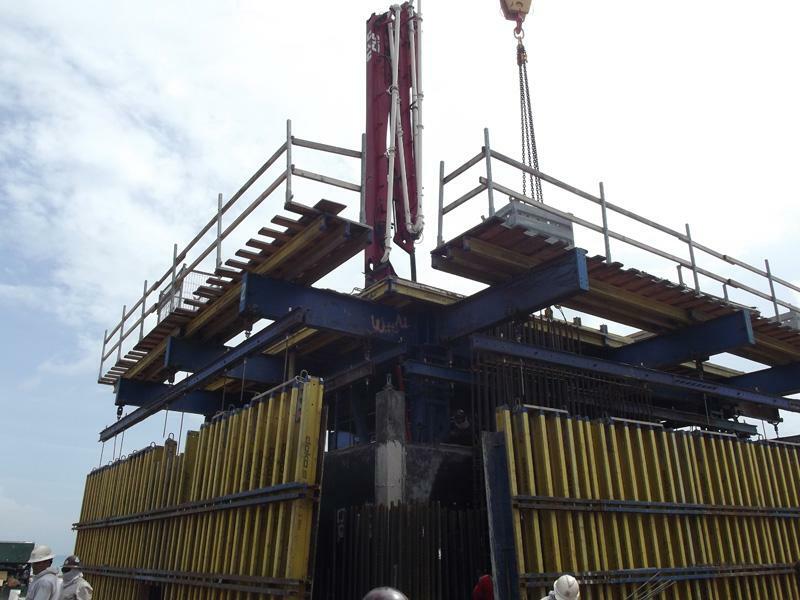 After pouring, the formwork for an entire next story is raised by powerful hydraulic cylinders from one casting section to the next. The Doka Super Climber is capable of supporting the largest concrete placing boom on the market, fully extended, while anchored into position or while climbing. Forms, platforms, and the placing boom are all cycled at the same time with minimal climbing time. Climbing can be completed in one singular smooth movement. Service loads can stay on the platforms while they are being raised. 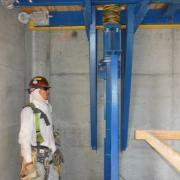 Doka’s engineering team worked in conjunction with SPS to locate lifting locations for the Super Climber. 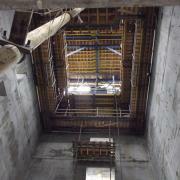 This involved addition of rebar, custom spanning beams and relocation of block-outs. 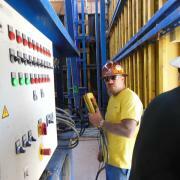 SPS planned the rebar gangs based on the location of the gantry beams so they could maximize the rebar labor efforts. On one side of the structure, the property line was within 15-feet of the edge of the building and the team was restricted from anything flying over the property line. 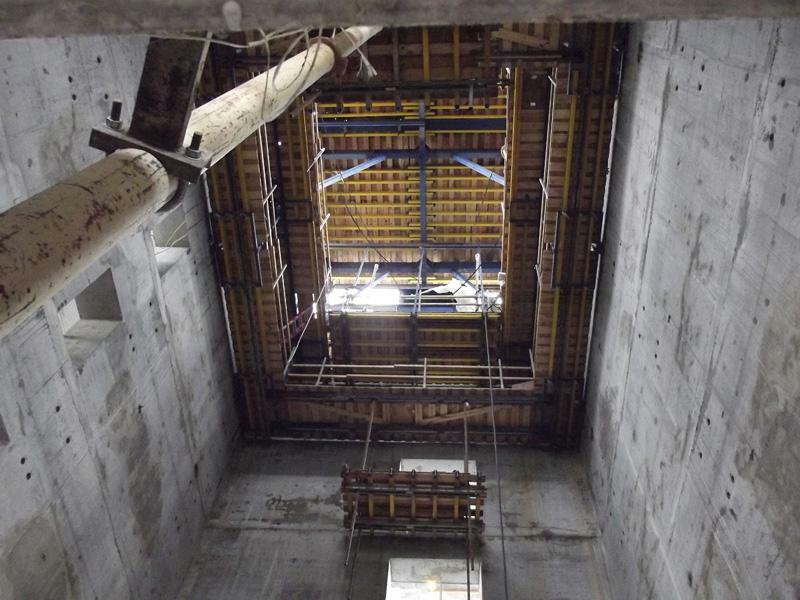 Additionally, the radial slab edges that change location and shape on every floor provided a great challenge to the design of the perimeter slab formwork. 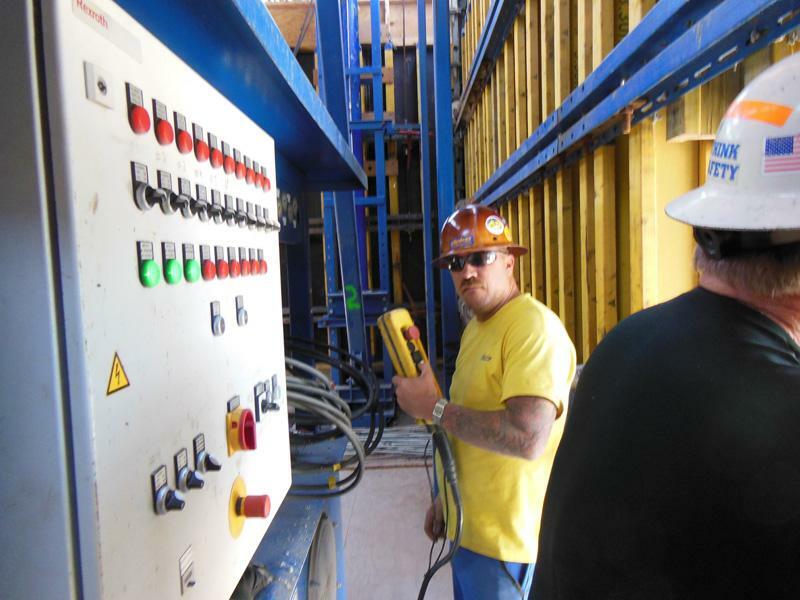 To meet these tight jobsite conditions, Doka and SPS worked closely to design custom pre-assembled Dokamatic tables that could easily be maneuvered with the building. The tables where designed for each area of the perimeter so that each could cycle from floor to floor without modification. Work began in February and is expected to be complete in January. 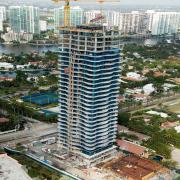 Thank you for your interest - Climbing as You Build the Most Luxurious Building in South Florida. 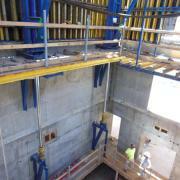 Thank you very much for your interest - Climbing as You Build the Most Luxurious Building in South Florida.